This, Dear Readers, is STEAM Education! Where will STEAM education get our children, you might ask? It will get us here. Not only are these photographs aesthetically stunning and imaginative (so much so that instead of posting about Thanksgiving, I had to share these with you), they’re also scientifically relevant. Sunny mornings like today always conjure up some of the spectacular vistas that stick in my mind from all sorts of places I've been in my life. Since I spent many years in the Bay Area, the views across the bay are some of the most frequent. And I'm not alone. Once you cross the Golden Gate Bridge, you never forget it. The view is nothing short of stunning in all directions. But there's a lot more to that bridge than meets the eye. I'd like to introduce you to our new Investigate Feats of Engineering titles by featuring the first in this category that we've done. 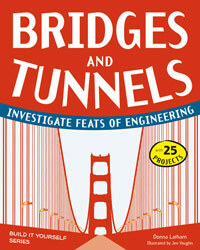 Bridges and Tunnels: Investigate Feats of Engineering with 25 Projects invites children 9 and up to explore the innovation and physical science behind these remarkable structures that our world depends on. They'll learn about some of the seemingly insurmountable obstacles like vast canyons and mountain ranges that engineers and builders have tackled to design and construct such amazing passageways. Should Students Be Code Literate? According to this post over at Edutopia, code literacy should be a 21st century educational requirement. After all, our children are students during the Digital Age. On a daily basis they navigate their way through game sites, facebook, and other complex digital environments. But, most students have no idea how these digital environments exist. As is true for most adults, they’re only aware of what’s on the surface—the new photo on their friend’s facebook page, or the funny tweet on twitter, and not, instead, on the code that allows that photo or that tweet to be posted or tweeted in the first place. Electoral College? Is That A Place You Go After High School? Looking for a bi-partisan way to explain the Electoral College to your kids? Okay, maybe your kids haven’t been following the candidates along their campaign trails. Maybe they don’t even know what either one of the candidates really stands for. Let’s face it, watching the debates on television probably didn’t beat out Phineas and Ferb – and if they did watch the debates, they probably still don’t have a good sense of what the candidates are talking about. The economy is a hot topic, but it’s a tough topic to grasp. However, it’s likely that your kids are interested in knowing which president gets elected. And they’ve probably made up their mind of who they would vote for today if they could vote.